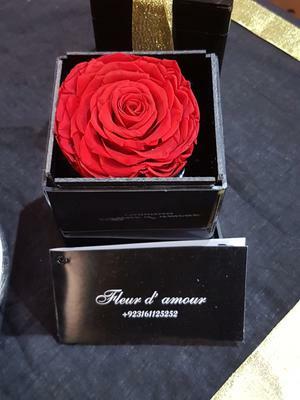 Fleur D' Amour pk is a venture that offers unique gift of love items with long lasting timeless roses in jars and in boxes. Q. What makes you so passionate about your work? A. I always wanted to be a trendsetter and start something that always ‘STANDS OUT’. Starting this business was a huge risk, but my drive to be unique and to stand out was bigger. The awestruck response of my clients when they find the rose exactly the same with every passing month keeps my drive alive to serve them. A. When I first came up with this idea, I really wanted one for myself and sadly no one in Pakistan dealt with timeless roses. This motivated me enough to bring these roses to Pakistan for people like me who appreciate the beauty of a bloomed rose when it is at its best. A. 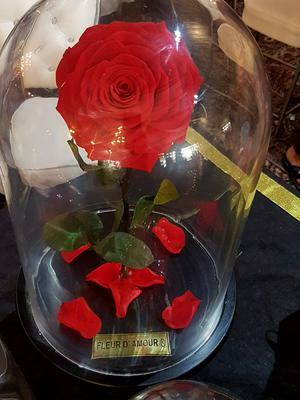 My vision was to create a Luxury roses boutique which doesn’t just sell romantic products, but joyful moments that can be cherished for a lifetime. I love when my roses truly make a lasting impression and my clients appreciate them, that’s the best feeling in the world. A. Well I think I have a very long way to go In Sha Allah, but yes one of the biggest achievements is the acceptance of my unique idea by the people of Pakistan. I don’t want to just stop here; I want to reach out everywhere. We offer worldwide delivery and we delivered to UK too, this shows that Pakistan is a country which can not only have but can even offer the best of luxury products. A. I am focusing on fleur d’amourpk at the moment and want to make it big, I don’t focus on sales, I focus on customer service. A. The advice that i would want to share is please be brave, take risks and chances that life has to offer you. Fear is natural but nothing can substitute experience. Have faith in Allah, work very hard and be sincere and leave the rest to Him.